In the second century, the Roman Empire had a growing problem. There were increasing numbers of these "Christians" everywhere, and they just would not cooperate with how the Empire did things. And the Romans simply could not understand why the Christians held themselves apart like that. 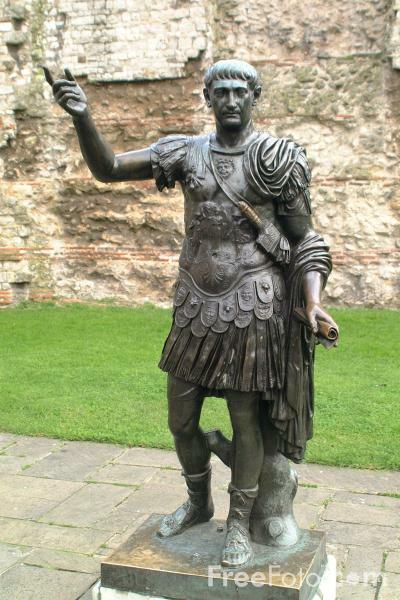 About the year 106, the Emperor Trajan, in thanksgiving for a great military victory, passed a law that all the people of Syria should offer a sacrifice to the traditional Roman gods. 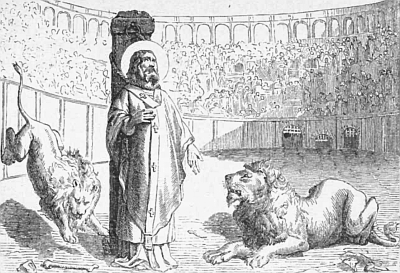 But in the middle of Syria was the capital, Antioch, and the Bishop of Antioch was Ignatius. St. Ignatius preached loudly, in his pulpit and in the streets, that Christians could not obey this law. The Romans simply did not understand this. Why couldn't the Christians do what everybody else did - offer the public sacrifice once, and then go home and follow their own religion in private? Why couldn't the Christians compartmentalize their faith, like everybody else? In our own time, our government increasingly acts the same way toward Christians. There are many examples, but one of the most important instances is the HHS Mandate: that all employers must offer their employees, in their health insurance plans, the benefits - and "benefits" are in quotation marks - of contraception, sterilization, and chemical abortions. And our government simply doesn't understand why we Christians cannot compartmentalize our faith, and perform our economic duties over here, in accordance with the law, and our religious duties over there, in private, however we want. In the Gospel today, Jesus teaches us that, "Unless a grain of wheat falls to the ground and dies, it remains only a grain of wheat. But if it dies, it brings forth much fruit." (Jn 12:24-5) St. Ignatius used this very Gospel passage in a letter to the Church in Rome. He pointed to himself, saying, "I am the grain of wheat." He called the teeth of the wild animals which would kill him in the arena, the "millstones" grinding the wheat into bread, a bread like Christ's own Body, that would nourish the faith of others. He wanted to be that bread, to nourish the Church and to change the Roman world. And that's exactly what he did as a martyr. The witness of his death for the crime of being a Christian and not committing idolatry nourished the faith of others. It took two hundred years, and thousands of martyrs dying for Christ, to change the Roman Empire, but it happened. In the fourth century, the Roman Empire became the Christian Roman Empire. That's why, when our own government was founded in the 18th century, it could be founded as a Christian government. But if we want to keep it a Christian government and a Christian country, we need to change the hearts and minds of our neighbors, by the witness of our lives. We may not be called to "red" martyrdom, but we still preach about Christ, or not, by the actions of our lives every day. Our actions show what are our priorities, and the daily witness of our charity shows whether we love God and neighbor. We are the only Christ, that those who don't yet know Him, can learn about Him by. We are the grains of wheat, and our daily witness for Him grinds us into bread. Will we be a tasteless and worthless bread of no value? Or will we be the bread that we really are as the Body of Christ - the bread that nourishes the faith of others?